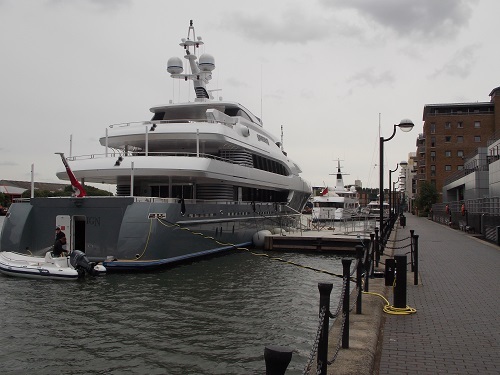 The two Super Yacht in West India Dock, Sovereign and WindQuest were yesterday afternoon joined by a third Kalinga. 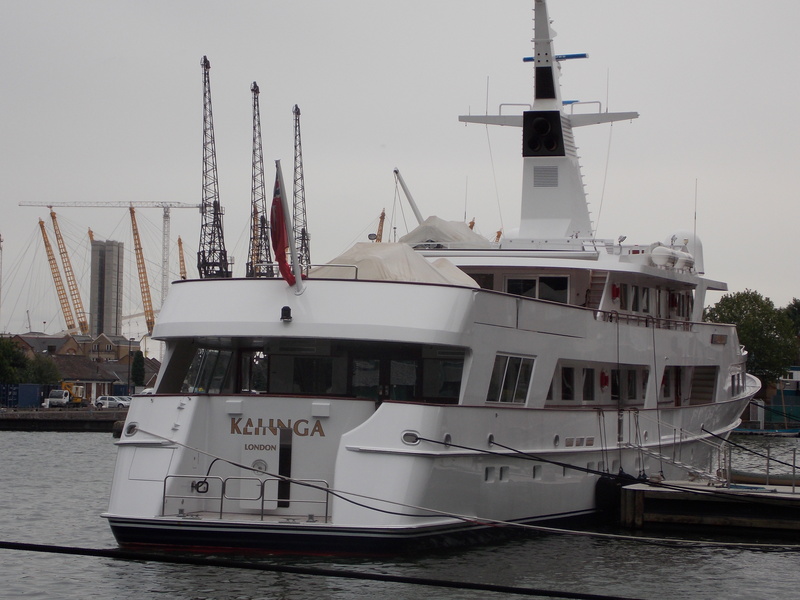 Although quite old , launched in 1982, Kalinga was built at the famous Dutch shipyard Feadship. Kalinga is a 53.70m yacht with a steel hull with a aluminium superstructure with a beam of 8.80m (28’10″ft) and a 3.00m (9’10″ft) draft . She has a cruising speed of 15.00 knots, max speed of 16.00 knots and a range of 4000.00 nm. from her 72,000.00l. 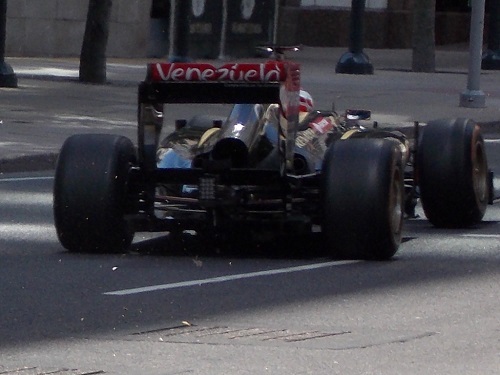 fuel tanks. 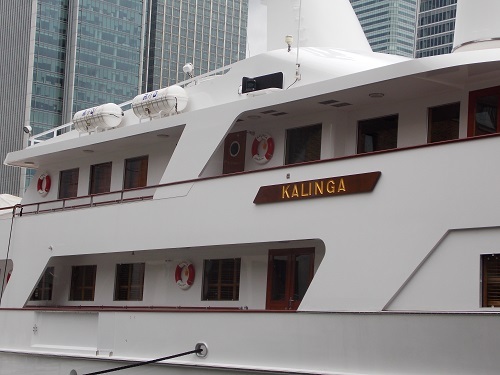 Kalinga has accommodation for up to 12 guests in 6 suits comprising 1 owner cabin, 2 double cabins. 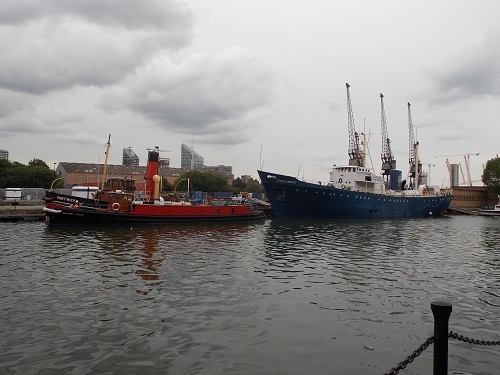 It appears that the ship has been used for charter in recent years and we have no information how long the ship will be in West India Dock. 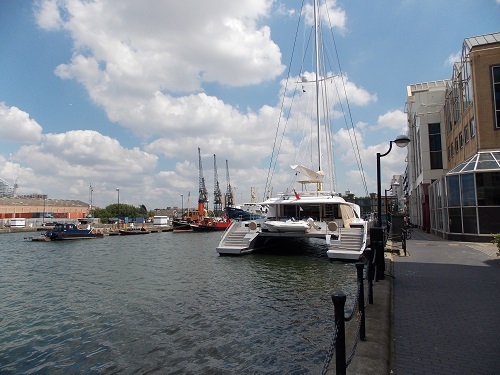 Just to prove that the dock is not just for Super yachts , at the end of the dock is the historic ships Massey Shaw and the Portwey. Also moored nearby is the training ship Lord Amory. 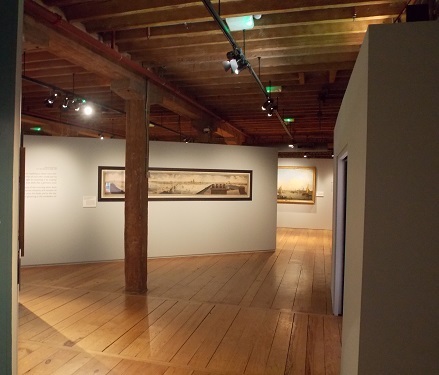 In a couple of recent posts, I have given some background on the Bridge Exhibition at the Museum of London Docklands which opens to the public on the 27th June. Well just before the big day, the press was given access to what is likely to be one of the highest profile exhibitions ever held at the Museum of London Docklands. 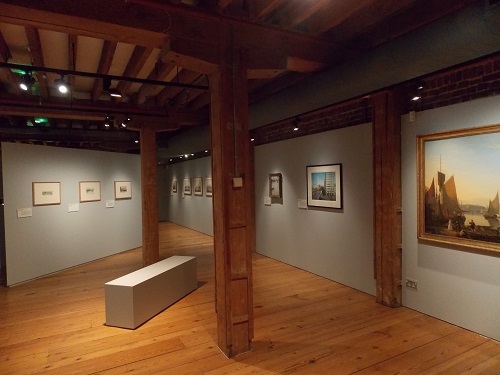 The exhibition is based in the 19th century warehouse which provides the ideal setting for the paintings, prints , photographs and films. Without doubt the star of the show is the very early photograph by William Henry Fox Talbot, it is quite incredible that the photograph has survived at all . 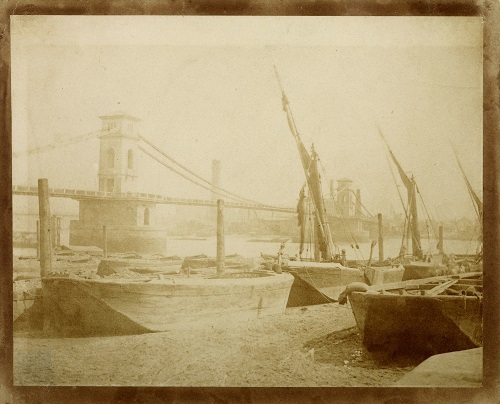 Called ‘ Old Hungerford Bridge’ the photo was taken in 1845 , when Fox Talbot was beginning to perfect the process that would dominate photography for the next 150 years. It is somewhat ironic that the bridge built by Isambard Kingdom Brunel only survived 15 years but this extremely fragile photograph has survived over 160 years. The Exhibition is built around the themes of Bridge ,River, Building , Crowds and Icons. 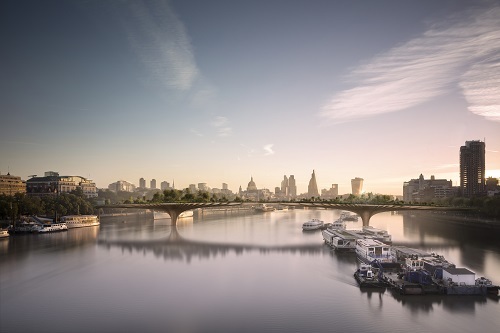 The Bridge theme considers the way that London for a long period reliant on London Bridge for a crossing, in the 19th century went through a Bridge building explosion fuelled by the industrial revolution and the growth of the railways. Etchings by Whistler illustrate this growth and pays homage to Old Westminster Bridge. The painting by Joseph Farrington made in 1789 gives an almost dreamlike impression of London before major building works on the river began. 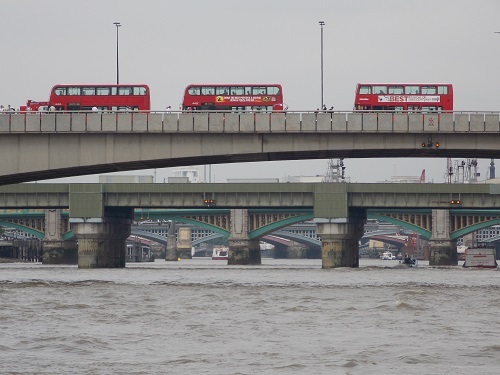 More recently the photograph taken inside London Bridge by Lucinda Grange challenges some of our preconceptions of bridges. The River theme makes the obvious point that without the river, London as we know it would not probably exist. The Thames has been a constant through centuries of change and has provided major challenges to those who would like to cross it . 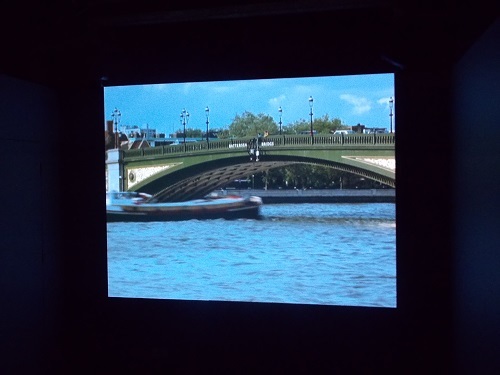 The William Raban film provides a visual tour through some of the stranger aspects of the river. The Building theme remind us that building bridges are not always an easy process and are often sources of great engineering ingenuity. 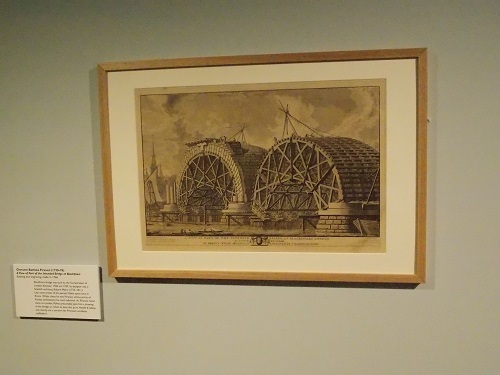 The etching by Giovanni Battista Piranesi of Blackfriars Bridge in 1766 illustrates some of the weird and wonderful designs that do not always come to fruition, the recent Thomas Heatherwick proposal for a Garden Bridge may be a classic case of this phenomenon. The Crowds theme looks at the way that Londoners have used the bridges often for their daily commute, this has often fascinated artists and photographers. 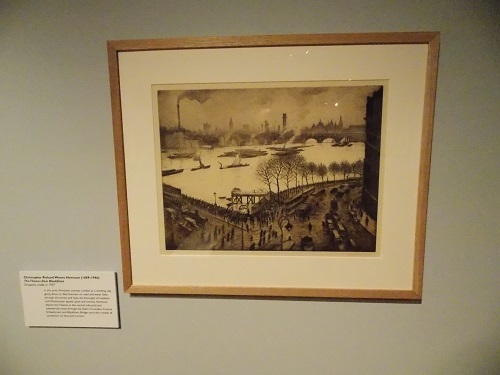 The picture by Christopher Richard Wynne Nevinson from 1927 illustrates London as a working industrial city. Finally, the exhibition looks at the way that the bridges themselves become Icons and how they come to represent the city as a whole. For many centuries London Bridge had its iconic role, however in more recent times Tower Bridge has become a focus of world attention especially during the 2012 Olympic Games. Ewan Gibbs Linocut offers a different view which in many ways references Whistler’s work. Though the exhibition is relatively small, its ambition and themes are large. 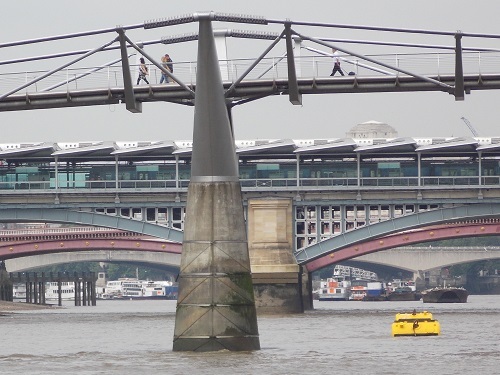 Like the Museum’s recent exhibition Estuary it examines how the river has played a major part in London’s development and how Bridges have become an integral part of that story. 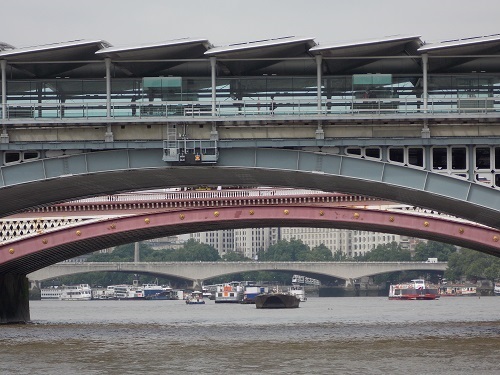 Using the Museum of London’s considerable art resources past and present , this free exhibition is one not to miss and if your bridge fixation is not satisfied visit other parts of the museum to see a scale model of Old London Bridge and many other interesting exhibits. Eric Pemberton has sent a wide range of postcards which I have shared with readers over the last year or so. Last week he sent a postcard that were quite unusual because it seemed to be related to recording Thunderstorms in East London. It has been filled in by a P.G Frank who was stationed one mile east of Whitechapel Church in 1933. After a little piece of research it appears that the postcards were part of a remarkable project undertaken by a S Morris Bower of Huddersfield. Modern Weather forecasting relies on satellite photographs and cutting edge technology, however before the digital revolution the weather forecasters relied on data often collected by ordinary people. 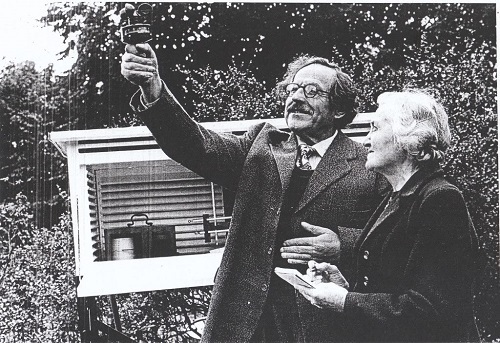 What was remarkable about Mr S Morris Bower was the scale of his project, he was always fascinated by thunderstorms and in 1924 decided to set up the Thunderstorm Census Organisation. 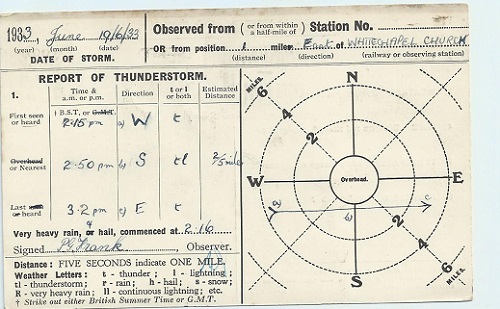 Showing a great deal of initiative he wrote to many newspapers and magazines asking for volunteers who would record thunderstorms in their area and send the data back to Mr Morris Bower in Huddersfield. Once the data was received both Mr Morris Bower and his wife collated the information and published the information in a annual report. Mr Bower has collected during the past few years so much data about thunderstorms from all over the British Isles that he is now able to publish an annual report. He has organised a small army of voluntary observers to work for him. They include naval and military officers, M.Ps, country vicars, shepherds, and scientists. There arc more than 1,000 of them scattered up and down the country in crowded cities, on isolated farms, and in lonely lighthouses. 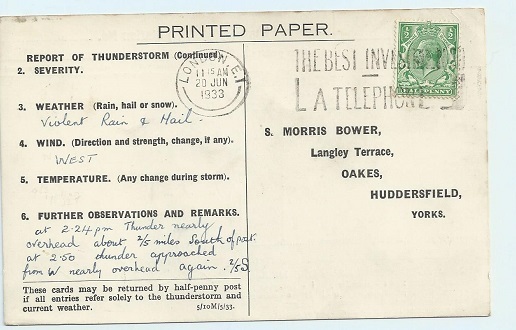 Whenever there is a thunderstorm in their district they fill in special postcards supplied by Mr Bower, and post them to him. It is suggested that the organisation once had 3000 volunteers who would send off their pre paid postcards. The cost alone regardless of time and labour was considerable but he and his wife seemed to make it their life’s work. Amazingly they carried on recording the data from 1924 to 1982 when he died. His method for measuring distance was interesting, he asked people to measure the time from the lightening strike to the thunderclap and worked out that 5 seconds was the equivalent to one mile. This was often taught to schoolchildren, how accurate it was is open to question. One the back of the postcard there is a franked message which says ” The best investment is a telephone ” , but for this type of research that was not the answer because so few people had telephones especially in remote areas. 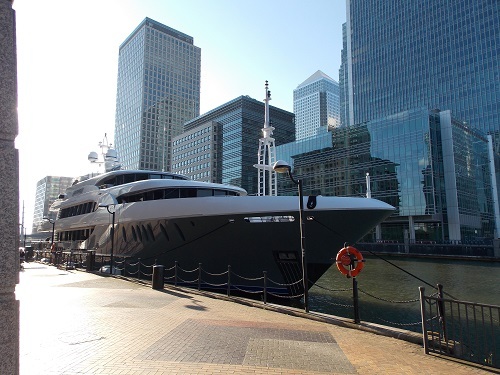 Canary Wharf on a Sunday morning is often a quiet place, ideal for a morning stroll around the old docks. 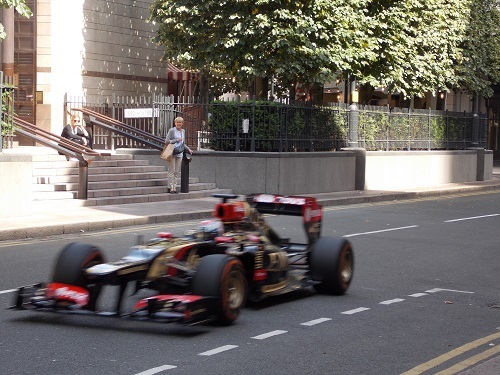 However this morning, many people’s quiet morning was disturbed by the roar of a racing car. 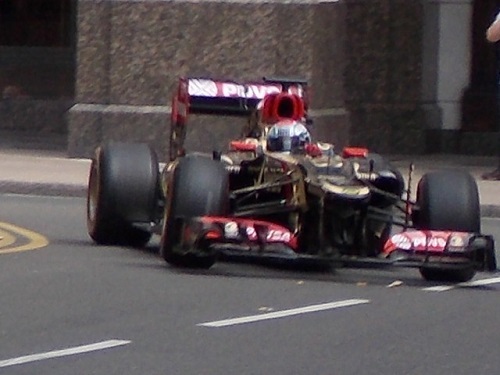 Under further investigation I came upon a rather strange scene of a racing car roaring around a small section of Canary Wharf watched by a few bemused spectators and a number of stewards. 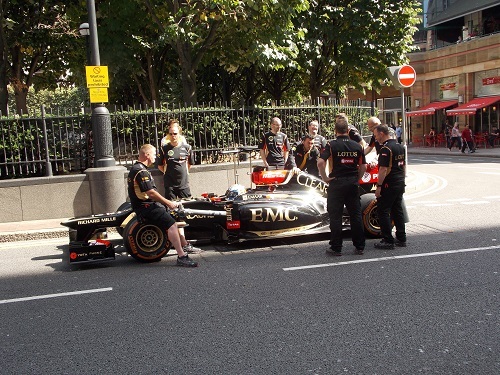 The pit stop was manned by Lotus racing , so I am presuming it was some kind of photo shoot for the team. 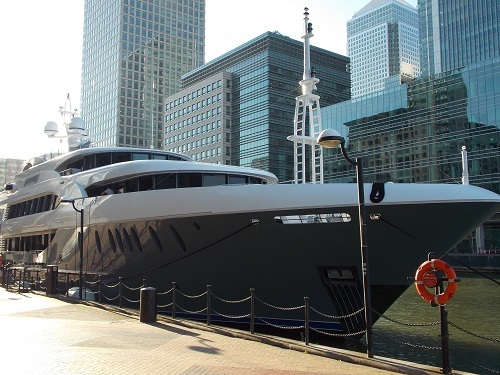 It is a strange aspect of Canary Wharf is that they do have a number of Camera Crews about at weekends. 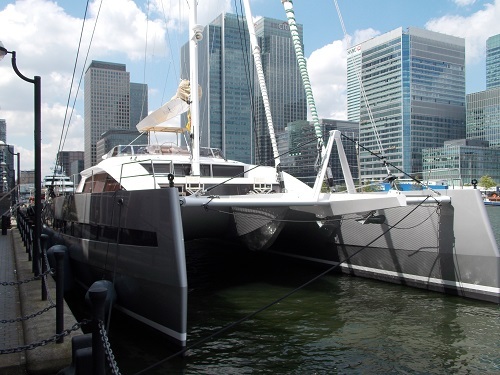 Earlier in the week, we welcomed Super Yacht Sovereign and now we have the arrival of a 85 foot Super yacht catamaran WindQuest. Built by French yacht builders JFA in 2014 , this is the first of a semi-custom “Long Island” series. 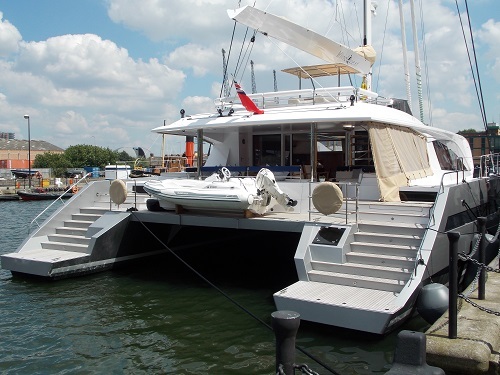 The hulls are aluminum-built while the deck is in composite material. WindQuest has three staterooms and an office. 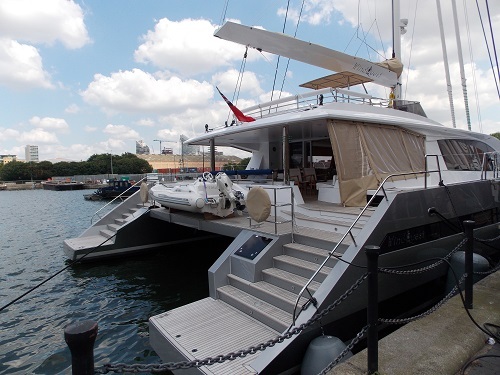 In total, eight guests and six crew can be accommodated. It has been built for fast cruising but has plenty of room for all the accessories including a tender. It has recently completed her maiden voyage in southern Brittany, and will sail along the English Channel and down the Atlantic coast travelling from London to Lisbon this summer before heading to the Caribbean this winter. 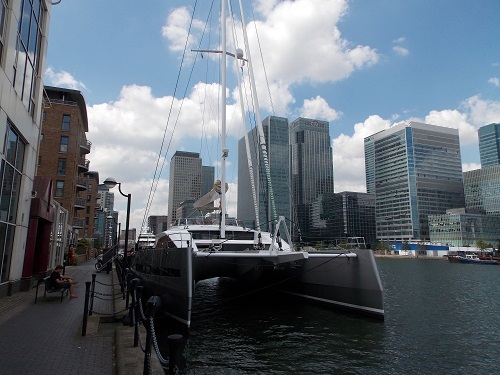 Although we have plenty of Super yachts that visit West India Dock, however catamaran’s Super yachts of this size are unusual. As is often the case, how long the boat will be in the dock is unknown. 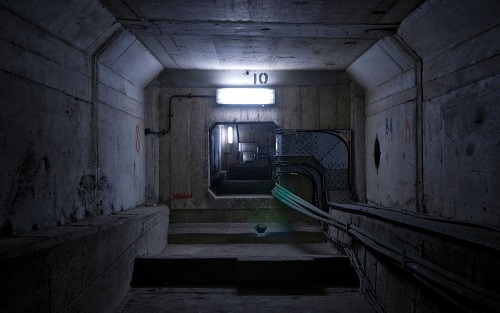 In a previous post I wrote about the forthcoming exhibition called Bridge at the The Museum of Docklands. 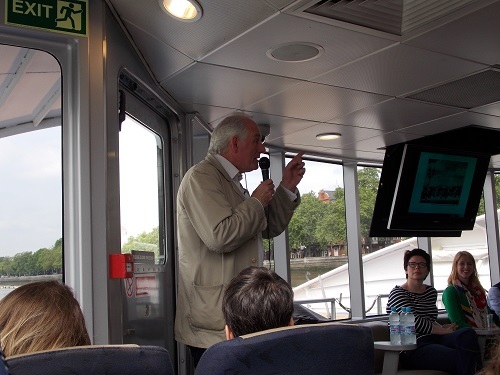 To give some insight into the exhibition, the museum organised a trip on the river by Thames Clipper to have a closer look at some of London Bridges. With renown architectural historian Dan Cruikshank as our guide, we departed London Bridge Pier and were made aware that it was once London Bridge that dominated the Thames for over 1700 years. 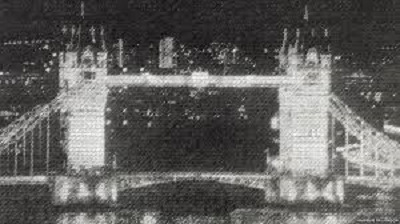 It was in the 18th and 19th century that a series of bridges were built over the Thames that meant that London Bridge lost its unique position in London and when the medieval bridge was finally pulled down in 1830 to be replaced by an elegant but not iconic stone bridge, it lost most of its historical significance. The bridges opened up the city to encourage development of the South of the River and enable freedom of people to move between the North and South especially when tolls were done away with. When your on the river and get past Tower Bridge heading west, you quickly realise how many bridges there are, ranging from pedestrian, railway and multi purpose bridges. 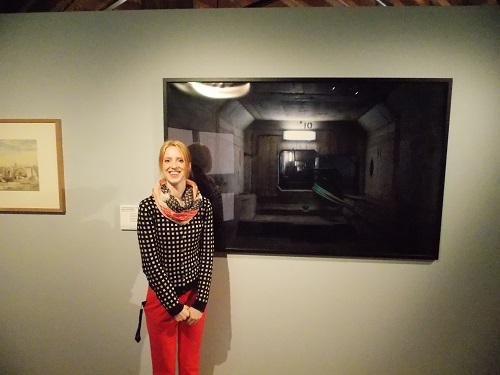 A few surprising facts are given by Dan Cruikshank such as the solid-looking London Bridge is actually hollow inside, in fact in the exhibition is a photograph by Lucinda Grange which illustrates this. 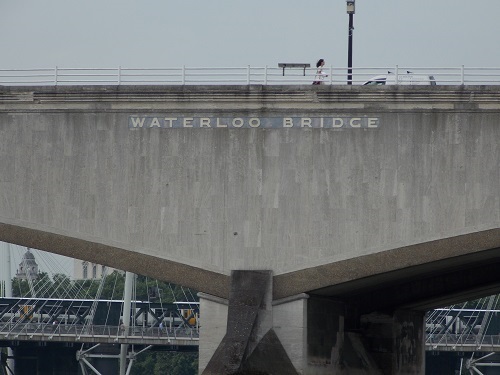 A couple of rather unusual facts was that Waterloo Bridge is known as the ‘Ladies Bridge’ because it was said it was mostly built using the labour of women in the Second World War , it also has a more melancholy reputation due to the high number of people who have committed suicide throwing themselves from it. The exhibition will have a large number of exhibits that will show existing and demolished bridges in paintings, prints and photographs, however it will also look at the way artists and writers have used bridges in their work. It is perhaps with some irony that the Bridge Exhibition will take place in a warehouse in the West India Dock area because it was the shipping trade that curtailed any suggestion of bridges east of Tower Bridge. The only major crossings attempted in this area were the tunnels at Wapping, Rotherhithe and Blackwall. For those who cannot make the exhibition, I will be writing a review next week. 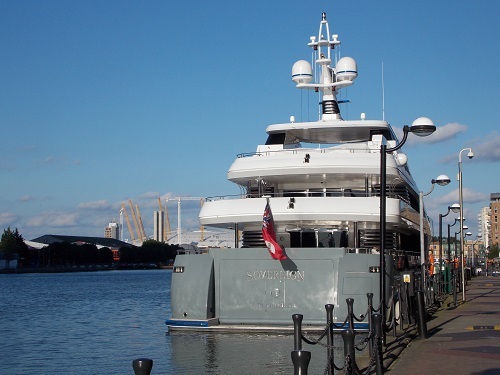 Now the warmer weather has arrived, we are having a few more visitors into West India Dock and today we welcome the Super yacht Sovereign. 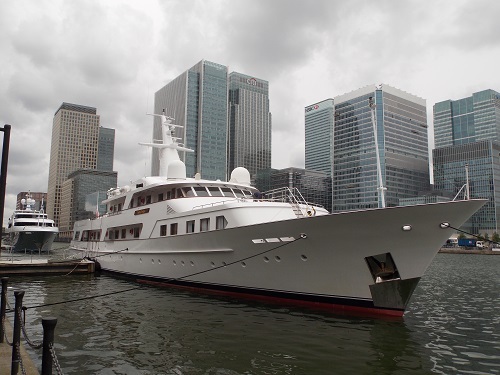 We do not often have American built yachts visiting the docks, however the Sovereign was built by Newcastle Shipyards in Palm Coast, Florida . When it was built-in 2011, the boat was known as Harbour Island, it changed ownership and underwent a name change in 2012. 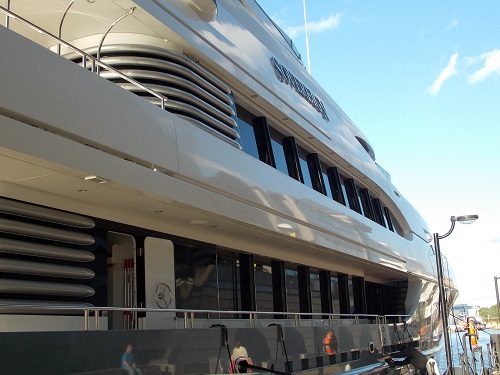 It is a 54.90m (180 ft ) luxury yacht which has a steel hull with an aluminium superstructure with a beam of 10.40m (34’1″ft) and a 2.90m (9’6″ft) draft. 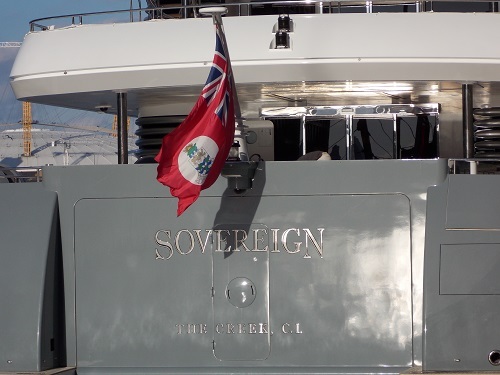 Sovereign has a top speed of 15 knots and a cruising speed of 12 knots. Sovereign has accommodation for up to 14 guests in 6 suites . She is also capable of carrying up to 7 crew on board. 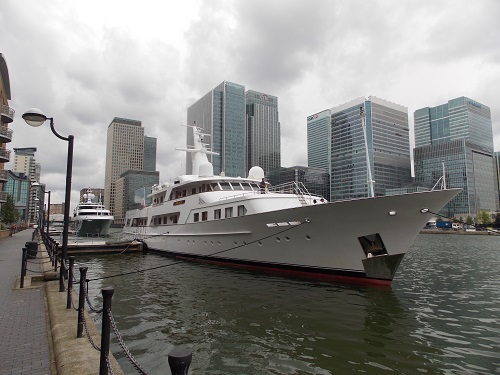 As regular readers will know, finding who owns the ship and how long it will remain in West India Dock is very difficult. 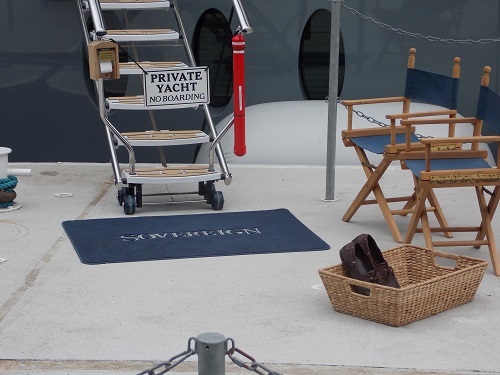 In the secretive world of Super yachts, perhaps not surprisingly they are very reticent to give out information.